Zapier is an online automation tool that connects your favorite apps, such as Gmail, Slack, MailChimp, and over 1,000 more. You can connect two or more apps to automate repetitive tasks without coding or relying on developers to build the integration, and our log management and monitoring platform can be connected with Zapier for alerting and incident management needs as well. Sematext has threshold, anomaly and / or heartbeat Alerts integration with Zapier's workflow automation tools. Log into your Zapier account and create Token needed to create the integration between Zapier and Sematext APM, Log Management, Tracing, and RUM platform. 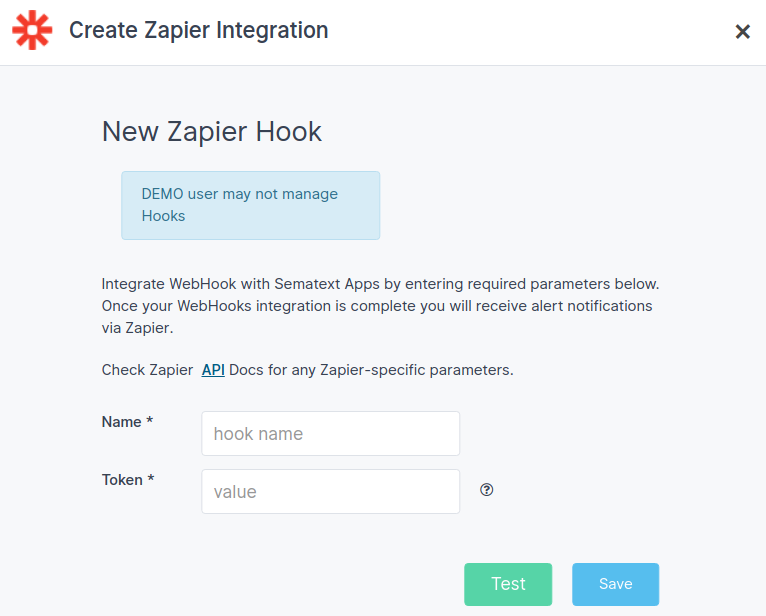 Also check Zapier's Webhooks for webhooks integration information. Visit Zapier's App Documentation for general information about their service as well as integration with other SaaS monitoring and logging tools such as ours. Navigate to Sematext Navigation Hooks and select Zapier card to create a new notification hook. Enter required parameters and copy incoming Zapier Token. Click Test button to confirm that Sematext app is sending data and save your Zapier alerts integration. Done. Every alert from your SPM app will be forwarded to Zapier, where you can manage escalation policies and configure notifications to other services like HipChat, Slack, Zapier, Flowdock, and more.